Contemporary stained glass artist Flora Jamieson has a love of swimming which is infectious! Specifically wild swimming. I was curious to hear more about Flora's personal story behind this bracing activity which connects her both to her environment, family, and childhood memories. More recently, Flora has self-published a popular book on wild swimming, full of tips and inspiring quotes, illustrated by Gemma Koomen. See my previous blog post for more details and read on to learn more about Flora! 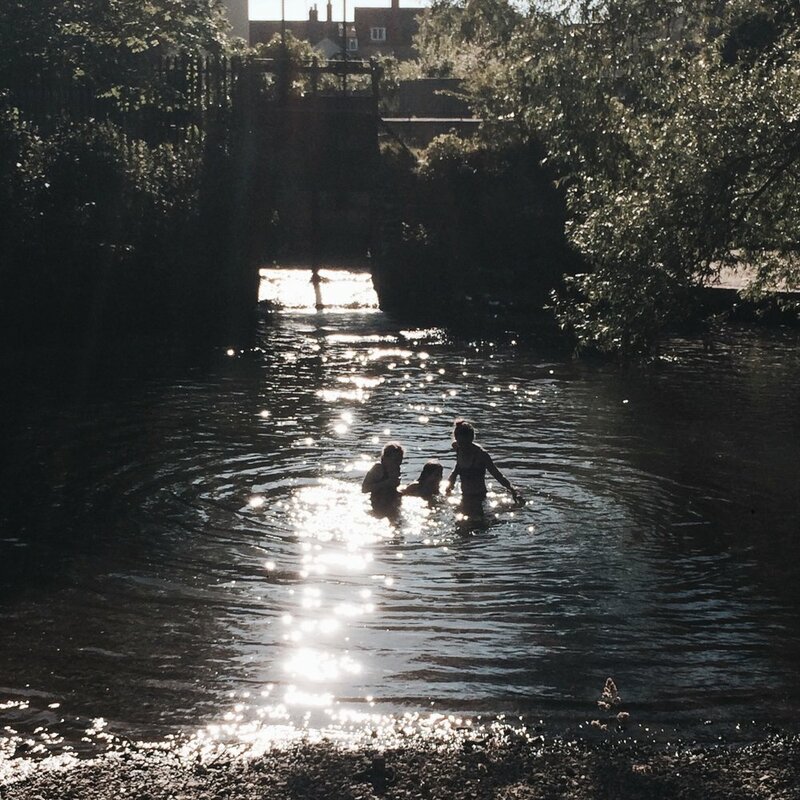 Where was the first place you remember wild swimming? "I’ve always lived close to water. When I was very young, my parents ran a pub in Berkshire with a garden that backed onto a river. My sister and I would spend hours wading and wallowing in it, looking for caddisfly larvae and pieces of old broken china (known as “mudlarking”). Later, when I was 7, we lived in a house that had a long garden which backed on to the Kennet and Avon Canal, and so that became my playground. I would spend afternoons on the sitting on the bank, fishing for minnows and feeding the ducks, coots and moorhens. It wasn’t really the done thing to swim in it, but we did anyway when it was too hot not to. The smell of meadowsweet and pondweed on a warm summer’s day always takes me back there. As I grew older, I sought out places to live by the sea: first in Brighton while I was at Sussex University, then Whitstable and now Bridport in Dorset, where I’m fortunate enough to have both the sea and freshwater swimming places on my doorstep". Which is your favourite quote in the book? “Our strength comes from that magic, from the earth and the sky, from the fire and the water. Fly high, swim deep, give back to the earth what she gives you...” by Juliet Marillier. It sums up everything I feel about wild swimming. I love the message about giving back, and we try to do a 2 minute beach (or river) clean, wherever we are swimming (see @2minutebeachclean on Instagram)." Was it something that you also did as a child with your family? "My mum has always loved swimming in the sea, and so from a young age I have shared her enthusiasm for it, and I have hopefully passed the same passion on to my two girls. As a family it is an activity we all enjoy, so our holidays often revolve around swimming. This summer we spent 2 weeks driving around Northern Spain in our campervan finding some wonderful rivers, pools and lakes to swim in. As much as we enjoy seeing the girls grow in confidence in the water, we are also careful to teach them about the risks and dangers involved." Which new location would you choose for your next wild swim? "So many places it’s hard to know where to begin. I’d definitely like to do more swimming in Scandinavia – we spent a week in a cabin by a lake in Sweden last year and swimming with my family in the midnight sunset was such a wonderful experience. As much as location is important, when I think of swims that have been really memorable, it’s often the company I’m with that makes for a really magical swim."